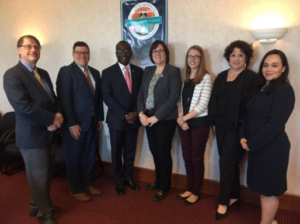 Global Cleveland visited Buffalo, New York this October as part of a city-to-city visit and was joined on by economic development leadership with The City of Cleveland and Cuyahoga County. The International Institute of Buffalo hosted a few meeting-packed days where new contacts were made, ideas were shared, and we came back to Cleveland with a new appreciation for the work being done in Buffalo. A city of about 260,000 residents, Buffalo resettles over 2,000 refugees a year. The International Institute of Buffalo has initiated a quarterly immigrant and refugee roundtable to foster collaboration between refugee serving organizations. Common themes include education, employment, healthcare, and housing. Buffalo’s roundtable is looking to grow their efforts and also collaborate with similar efforts within city and county offices, which have established their own roundtables to discuss refugee integration. Global Cleveland attended one of these roundtables, where more than 35 individuals attended from a wide variety of organizations. The group discussed ideas to develop collaboration opportunities including hosting a summit on the state of refugees in Buffalo, creating a channel for communication amongst resettlement agencies and service providers, and collectively working to apply for funding to eliminate competition and duplication of services. At the roundtable and during a pre-roundtable steering committee session, Global Cleveland shared information about the Greater Cleveland Refugee Services Collaborative (RSC) and the unique structure in place in Cleveland: the collaborative is coordinated by an independent consultant, who has an objective understanding of each member organization. She can then facilitates strategic partnerships, outreach, and topics to discuss based on overall needs within the community and each organization’s area of strength. Cleveland and Cuyahoga County economic development leaders shared the perspective of working with city and county level officials to allocate proportionate resources or portions of existing efforts for immigrant and refugee populations, rather than looking to create separate programs. One example is when looking at real estate development and allocating mixed-use development for government incentives, have the City department specifically allocate a portion of that housing to go to refugee or immigrant populations. 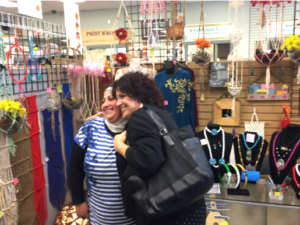 Denise with the International Institute of Buffalo greets one of the West Bazaar retailers on our visit. We enjoyed Ethiopian and Thai food after exploring the bazaar and heard about the businesses being incubated by the bazaar’s manager. Buffalo’s West Side Bazaar, a WEDI initiative, is a small business incubator that supports entrepreneurs on their path to becoming successful business owners and enables many immigrant, refugee, and low-income individuals to pursue their dreams of small business ownership. They provide space for several food, food retail, and retail vendors to sell quality authentic products from all around the world. Programs like this provide an opportunity for entrepreneurs to grow their business in a supportive environment and to get started on the path to owning a storefront or stand alone business. The West Side Bazaar has become a destination for immigrants, refugees, and locals to taste international cuisine, shop for culturally unique clothing and gifts, and come together across cultures. Read more about the West Side Bazaar here, in a post by Karibu News: Buffalo’s multilingual & multicultural refugee and immigrant focused newspaper. Increased access to job postings, City services, 311 hotline, etc. We were impressed by the level of public commitment from the mayor’s office in the City of Buffalo to address the needs of New Americans, and were reminded that many similar organizations are also relatively young and we are often figuring things out as we go, developing strategic plans and determining the best way to move forward in integrating immigrant and refugee populations to our cities. 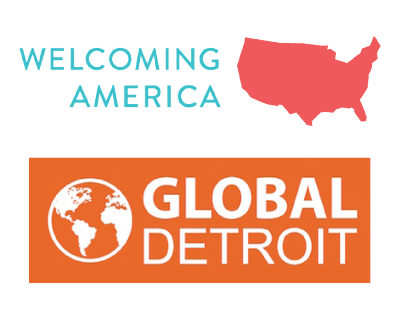 City-to-city visits and networks like WE Global are critically helpful to further the work of immigrant integration and economic development across regions. The conversation with City Hall also included the idea to resist creating new programs, but to instead find creative ways to ensure immigrants and refugees are integrated into existing efforts and programs in your city with a focus on economic development. Key to all of these efforts is a focus on equitable access. Global Cleveland will continue to find ways to collaborate with the City of Cleveland, Cuyahoga County, the Refugee Services Collaborative and member organizations, (and countless more). Global Cleveland presents all new citizens with a certificate including letters from the Mayor and the County Executive at bi-monthly naturalization ceremonies that also includes a packet of information that also includes business resources, City and County Economic Development Department programs, and ways to connect with Global Cleveland. As we seek to better facilitate connections between the international community in Cleveland and our local economic development infrastructure, we also strengthen our partnerships with local government. We shared this certificate with Buffalo’s Office of New Americans, and will be in touch as they also develop welcoming strategies for New Americans in Buffalo. Governments need to take advantage of the immense opportunity for economic development through partnering with immigrant and refugee serving organizations in order to better integrate welcoming strategies into mainstream economic development practices. In doing this, we can further the economic and social successes of the international community in Cleveland.